-How can this be possible? Wasn't the summer cooler? NASA world wide and Northern Hemisphere surface temperature anomaly 5th warmest in history. October 2008 NH anomaly +0.92 C 4th warmest in history. Jumping from September's +0.59 C... In July Northern Hemisphere was 8th warmest in history for Northern hemisphere. The common explanation, temperature variation, does not respect logic, not that heat behaves irrationally, it simply moves vertically. Upwards, the natural commonly expected daily movement..... Downwards? How about downwards?? Yes, it travels downwards as well. By clouds, not simply one layer, but many, interlaced with aerosols, some with strong cloud seeding properties, that's it! We have downwelling IR, on a massive scale, especially in the Arctic, with mighty heat sources like the Arctic Ocean, combined with an already warm Arctic atmosphere. Considering surface temperatures as an anthropogenic GW indicator only works long term. Monitoring Density Weighted Temperature of the entire atmosphere, as I do, reduces variation, and by following the laws of thermal dynamics , I can see the future, written in the recent past... Cooling of any physical body, large or small, is done at a constant rate, a warm atmosphere doesn't become cold in an instant. Clouds in winter reflects the heat from above downwards, warming the surface makes the air immediately above warmer by convection, if this feedback loop remains more or less consistently, a significant surface warming appears.. Transposed air to ground heat cools in darkness at a constant rate nevertheless, but a denser lower air layer guaranties a cooling above the clouds, this cooling by steeper adiabatic lapse rates is often mistaken as a cooler atmosphere, it is cooler much higher in altitude, but not as a whole. Will repeat this message as long as I am not getting through, there is an important need to consider atmospheric temperatures as a whole... This will ultimately squash the last doubts that the world is not warming. Long Night Sunset; Very round sun, with a cloud lower right flash. The sunset at -1.12 degrees is the highest long night sunset eve seen here since 2000 (-1.70 in 2000). A sure indicator of heat above. I have basically 2 pictures in October 08, compared to about 100 last year.. It was that cloudy! Today I got first glimpse of a November high arctic sunset, my telescope was not at the ready, I was elsewhere and took pictures with a small digital camera, not as good as with telescopes, nevertheless this sunset was remarkably early, the earliest November sunset in EH2r history, despite inversion mirages which should technically help boost the sun upwards. 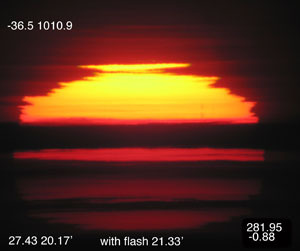 EH2r 2000 sunset was -1.7 degrees below the astronomical horizon. Having failed for the first time since 2003 in making a correct temperature projection was very good! I have reviewed my techniques, and found an aerosol flaw, attached with ENSO. I was always a strong believer that the Southern oscillation has nothing to do with Arctic temperatures, but I looked too much at the surface and not as much aloft. 2008 has taught me the importance of clouds, and what causes them to be abundant. Aerosols play a role in seeding, as you can read below. By which the stratospheric vortex acts as a very significant role in affecting cloud formation further below, hence affecting surface temperatures, but not the overall temperature of the atmosphere, which is warming continuously. The distinction has triggered me to make 2 temperature projections, one for the surface the other for the entire troposphere. The entire atmosphere temperature forecast is easier! I have been essentially always correct with this one, LaNina reducing anvil seeding is a theory which I will practice, and therefore apply its effects with respect to surface projections. Winter 2008 Northern Hemisphere temperature projection, warmest in history, pending a January 2009 Vortex amendment. So far the vortex is weaker than last year, hence its cloudier than last year, this makes the beginning of winter similar to 2006-07, significantly warmer temperature surface conditions will persist given weak Vortex encouraging Arctic cloud seeding. This means ultimately more heat towards the surface from an atmosphere proven resilient, despite equatorial cooling from a strong La-Nina just past. Finally I found a website which shows winds in the stratosphere. just as the air cleared and we are cooler by 16 degrees C down to -26 C overnight. Lets look back to beginning of October, then we look here at today, the 50 mb pressure heights are narrowing, the winds are certainly stronger,doubled in speed on the Russian side. On the 26 of October there was a small vortex jet preview above Resolute. The larger view demonstrates that the vortex is just beginning, in a few months it will be like this. Very strong winds aloft, double or triple the present speeds aloft. It's back! High Arctic clouds starting to clear, Polar Stratospheric vortex is reborn! With stratospheric winds in the Canadian High Arctic in excess of 110 knots, we are starting to see more stars with the low sun as well, its still quite cloudy, but all signs are for the usual late autumnal clearing, now understood, by two processes; the return of new sea ice, and the high winds of the Polar Stratospheric vortex, keeping in suspension Anvil seeds. The grip of winter gains strength through the dark long clear night. Ozone holes are usually associated with significant vortex having very low temperatures, a complex supplementary cooling aloft is caused by ozone depleting chemical reactions actually decreasing the temperatures in the Stratosphere further, this cooling is said to bring lower surface temperatures at the Poles during winter. The cooler the stratosphere air, the stronger the vortex. There is a twist as well, if I am correct, the stronger vortex winds keep in suspension Anvil seeds, which reduce cloud extent below, amplifying the cooling on the surface more significantly. This is proven indirectly when the Vortex disappears in April, when clouds all of a sudden reappear despite very much cold air between -20 and -35 C, with the ice cap much frozen and very little moisture to justify such an increase in cloudiness. There is a natural spring heat balance between the rising sun and sudden increase in cloud extent, haze, ice crystal albedo, which contribute to a winter lag. If the vortex is not so strong, stratospheric cloud seeding is less disrupted making a warmer winter. If the vortex is extremely strong, such as it was in 1996-97, 2007-08, the sun warms the pole quicker in clearer surface air not before significant cooling has occurred, the link between ozone destruction and cooler surface air should be true, but not so during late spring. All eyes should then observe the vortex, inter-compare its size and magnitude. As a way to judge how mean a winter we are having. Lately clouds dominate as never before in the High Arctic, even in autumn, this coverage is nothing short but spectacular. The reverse was true this past spring. Are the two events related? Perhaps they are. In the spring there was very few clouds, I reasoned, it was from new sea ice, something of the nature of new ice, sea micro-organisms having lost their ice homes during the great melt of the summer of 2007, surely has impacted the entire atmospheric systems. Certainly new ice caused something different. But there was something else which affected the lack of clouds January-May 2008, resulting to nothing but clouds from May till today. Ice surface is a repository of whatever falls from above. The great 2007 melt essentially got rid of years of refined particulates coming from all over the world, even toxophene, a by-product from Southeast Asian PCP incineration, was found in the High Arctic. A great deal of these natural and artificial landed aerosols, disappeared, melted in the sea along with sea ice. The winter of 2007-08. had vast areas of new ice, without none of the usual aggregates of fine particulates, some having cloud seeding properties. In the spring of 2008, the Arctic surface got really cold, totally due to absence of clouds. The stratospheric vortex raged above, with winds faster than 210 knots, keeping particulates in suspension and creating new ones by extreme mixing. From January till April 2008, the icescape of the Arctic ocean became a zone much reduced in landed particulates. Causing “big blue” sky event, giving a dramatic cooling on the surface due to lack of clouds. Then May came along, first sign of increase cloud coverage, which lasted all summer. Here the seeds from April vanished stratospheric vortex slowly got planted all over the Polar area. Along with some strong convective action around the Equator, at least much more prominent than when La-Nina dominated in December -February. The resulting colder winter meant extended sea ice coverage, again an area receptive to a great fallout from above. Further South in August/September, great hurricanes hit the SE USA, Ike in particular covered the entirety of the Gulf of Mexico, continued overshooting ice crystals in the stratosphere. Some studies suggest that these ice crystals sublimate, dehydrate quickly in the very dry Stratosphere, the chemicals within these crystals should remain and travel to the Poles. Remaking the same seeding that once carried them very high in the sky. A cold cloud connection is made from Equator to Poles. La-Nina gives less convection to the stratosphere, hence the Poles have less Anvil seeds to cause clouds, these affect weather systems either by massive absence or presence of seeding. ENSO affects the Poles not just by an esoteric planetary wave changing temperature drop at the Equator, but by not overcharging the Stratosphere with anvil seeds. As far as I can see, this idea works quite well with La-Nina seasons. CAUSE: La-Nina cooling, slowing or stopping convective activity all together from a great equatorial region, EFFECT: after a short lag of time, great cooling over the Arctic Ocean from lack of clouds…… I’ve checked La-Nina events vs temperature cooling over the Arctic, in almost every occasion, there was a significant cooling shortly after a significant La-Nina. It looks good, anvil seeding or not may indeed be affecting Arctic weather. Nearly as much ice has melted compared to last year. Even when the summer of 2008 was extremely cloudier than during the summer of 2007. Although the ice surface area seems bigger for 2008, it has substantially less old ice, and a lot more new comparatively thin ice. I surmised that the reason for this great melt despite all factors favoring the opposite, was the warm air, not measured off the surface, but still present at a higher level. Which has helped this great melt be. Infra red radiation is not readily measured at all locations over the ice pack. But if there was warm air, below or at the cloud level, infra red radiation would have contributed to nearly equal the record melt of last year. In other words, somehow, the atmosphere was warm, and recreated almost the same formidable melt without the help of direct sunshine, vaster open much warmer water as well. The atmosphere is quite complex, I do not completely understand the raising of vast areas of warmer air, while the surface cooled a little, by what process this warm air does not return to the surface as readily is a puzzle. But this I know, there was no cooling for the troposphere as a whole, the warm air is somewhere between the 950 to 700 mb level, stayed present in the spring despite incredible clear air surface cooling (to -47 C), warm air which played a role in another massive summer polar ice cap melt. September 2008, sun disks measured in Resolute , the few peeked through the same "cooling" clouds, are very expanded, I am hitting expansion records on many measurements. DWT Upper Air results show a +2 Kelvin increase over September 2007. Against a somewhat cooler by 1 C surface , but the heat continues. Many of the sun line colours are hard to explain, also structures following the tree top profiles are utterly fascinating, equally difficult to prove why they morph the tree tops exactly. 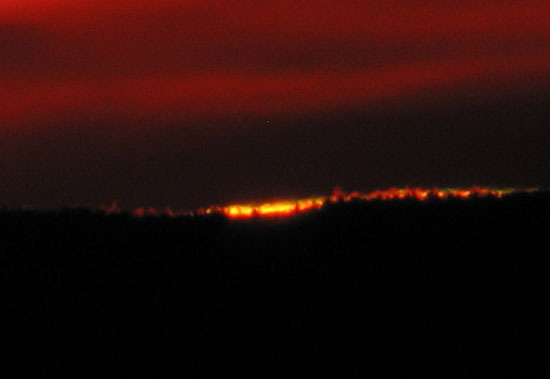 Visually speaking, many people saw the final sunset as green, hence there was a green flash not captured on camera. Infra red, interferes with the ccd, making the sky colour definitely redder. It is possible that the flash was not captured as well. -But do they really reflect current trends? It’s the topic of this year, why all the surface temperature variations? Again, April 2008 NASA Data showed a tepid +0.71 C for the month, compared to a positively hot March anomaly of +1.4 C. all for the Northern Hemisphere. What is not reflected here is the lack of clouds, which in darkness causes considerable cooling of the surface, but right above, the air may be warmer, as was the case here when very low temperatures lasted long in near cloudless skies. But the Upper Air was warmer, making the surface record oblivious to reality. Surface temperature trends are judged by the decade, not month by month. But Density Weighted calculations show a far more consistent trend, with very little variations, especially considering the troposphere and stratosphere as one weighted stratum. As I write , it is +10 C above average, given our one location, this warm weather spans a huge Arctic area though. It does not mean that the rest of the world follows, but the apparent NH temperature cooling in April, has no significance, nor bearing, this warming is amazing as this was all done without clouds. However weighted density temperatures have projected this months ago. It's time to sharpen climate projections by using DWT’s. To the left is the most potent standard climate graph presentation, it is a Density Weighted Temperature of February to April 2007 and 2008 respectively. It shows a standard winter, when its coldest in March and April is warmer. Looking closer, there was hardly a difference between 2007 and 2008. Surprising isn't it? Surface temperatures in February were much colder in 2008. Not to confuse with all time individual expansions as written below, sun disks vertical diameter averages were the usual method for projections. Usually solidly accurate in temperature projections, a top number of individual decima level maximum limits was exceeded today, beating 2005 and 2007. For instance ay 0 degrees 2008 had the most expanded sun disks on average. Blue skies completely dominate again, along with a High pressure system, massive for this time of the year, 1047 mb, right North of Alaska, its usual Arctic ocean location. But sun disks penetrating a segment of this High pressure stratum are expanded, except smack at High pressure center, another great sun disk observation discovery. Everything expected as written below, has transpired. There is not much hope so far for the old multi- year ice, Arctic Ocean satellite pictures have been quite clear of clouds, compared to total overcast spring conditions so familiar every year past, especially South over the Archipelago. We are dealing with a different climate going along with a changed Arctic ice-scape. These numbers are all time highest sun disks, not the usual average, so numerous for 2008, that I had to revise statistical analysis method. Comparable with 2005 having a least one observation. 2005 had the distinction of being cloudier, one would imagine much warmer then, a reduction in inter-comparisons was necessary, because of gaps on certain 2005 decimal elevation levels. Without a doubt, the clear skies should be naturally colder as they were for the surface record. However, the Upper Air, despite huge amounts of radiation escaping to space during the long night, kept warm. As written below, a Vertical merge occurred in early April, its been significantly above average temperatures ever since. For those baffled by this method prediction powers, think of the atmosphere as in total flux, always seeking to balance density inequities between regions, some areas are poor for mixing, some like Resolute Bay, in the middle of the High Arctic Canadian Archipelago, are ideal mixing zones. When the sun disk appears bigger, its because the air is less dense, greatly expanded sun disks were captured on camera. Meaning that unlike 2005, when clouds were more dominant, there was clear atmospheric heat, unprecedented, which will affect the coming summer and years to come. I expect the old Arctic Ocean ice to take a huge hit, perhaps will go down between 1 to 2 million square Kilometers by mid September. As expected 2008 spring was quite warm, the question remains about the coming summer, and it looks like it will be very hot. Enough to challenge the warmest summers? Current sun disk expansions will tell. They reached 2nd place yesterday. No insignificant posistion, compared to warm years 2005 to 2007. Logically 2008 should be #1 by beginning of May. If so, the summer of 2008 will be the warmest in history for the Northern hemisphere. Stay linked! Two sun disks pose an incredible challenge in meteorology. The one to the left March 25 2008 had a compressed sun disk without a major inversion near the surface, the one to the right taken at a spatial location further below, had a significantly larger vertical sun disk with again no significant inversion at the Upper air station just near by. This poses a serious resolution question. How reliable are our current observation networks when weather can be significantly different at a short near by distance from a data observation center. The immediate response would be temperature related, yet the colder temperature reading gave the bigger sun disk. The next question is pressure, the greater the pressure, theoretically, the smaller the sun disk, its not usually so, direct pressure responses are rare, and usually happen when the sun is positioned at or near a high pressure center. The likely reason these two sun disks are different is that the weather in the air penetrated by the sun is radically different. There is a need to understand why this happens. A world wide camera network, lets say 100. 000 sun dedicated cameras, may eliminate completely data gaps which would vastly improve forecasting. NASA has just released March 2008 surface temperature DATA, it came as expected, if you care to read just below. With a Northern Hemisphere temperature anomaly of +1.40 C , it was the warmest March in Northern Hemisphere history tied with 2002. There were no real reasons to believe that there was a cooling trend. The lower Upper Air temperatures were as strong as any recent warm year. Now in very warm Resolute April, again with clear skies, its not difficult to estimate a very warm summer to come. La-Nina is passing, and especially clear Arctic skies will likely make it so. I am currently entrenched in studying sun disks, and there is many reasons to believe a coming very hot summer, yet I will wait and let the numbers gathered speak for themselves... In the meantime, for you the follower of EH2r.com, CHEERS ladies and gentlemen! I am celebrating my better understanding of our atmosphere. With April and May 2008 left to do, 2008 will challenge 2005 and 2007 for vertical sun disk average supremacy. EROAM results in blue and pink, are quite fascinating, they suggest a consistent alternance in Refraction gathered temperatures from month to month. If February is cold, March Warm, vice versa. EROAM.2 is still experimental. But unlike 2005 and 07 when Cold refraction temperatures bottomed in March, 2008 so far is a bit of a puzzle. Clues are given out though, EROAM early results suggest spring 2008 to be similar to 2006 and 2004, essentially cooler years, but April may push that idea aside. It was quite impressive, that the coldest weather possible, from many continuous days of clear air, gave warmer results than record breaking 2007. This is a hint, which leaves sunshine to play a role similar to 2007 a great melt is in sight again, but then again April Polar clouds may put an end to this, none are seen so far. This is the coldest time of the year, yet 2008 sun disk sizes rival recent warmest years, impressive. This leads to a fairly simply preliminary conclusion, early spring will be very warm, rivaling 2007. The small blip of recent cooling is still a bit of a mystery (although it wasn't omnipresent everywhere), much related to the lack of Canadian Arctic clouds, La-Nina at its December-January peak cooled the world average as well. Sunsets to date gave mixed results, its too early to judge a trend with them. A clue again is by the thin ice and its multiple leads. Big question I had was whether organic cloud seeding has been affected by the disappearance of old ice, apparently it is so. Historically the high Arctic has clear air between mid-December and Early March, this is not new, but the lack of production usually starting now, of cloud like Polar ice coverage seems lame, Recently more often than not the Arctic can be seen entirely with very few obstructions (as with this March 15 NOAA NIR sat pic). The lack of clouds during the long night just past may be associated with thin ice? Mechanisms of which I am not sure, or it could be associated with the old ice, much compressed against the Canadian archipelago? The latter dark night scenario seems more possible... The difference between a record warm spring and the usual very warm spring will be made by cloud activity over the Arctic Ocean. News from February data may appear quite strange. A great Arctic chunk appears to have been extremely warmer, Euro-Asian Arctic region, just below this warm zone lies Asia's now made famous by the news it made especially in China. The North Russian warming may be understood by the thin Polar ice, while the Asian cooling, well, its out of reach of my data stream. The North American bit, I understand quite well though, its not as simple as it looks on the map. LaNina may have played a role, but its hard for me to understand what LaNina has to do with Arctic clear air. What was always persistent is the role of the Canadian Arctic in generating cold air affecting deep South areas all the way to Florida. Now this is something which molds planetary waves, which was most stable, just like the lack of clouds in the Canadian Arctic. My impression is that this clear air weighed more than LaNina for North America. All while LaNina, being at the equator, covering a huge area, obviously contributed to Northern Hemisphere cooling. Above 60 degrees North the average anomaly was +2 degrees C. While from 0 to 30 degrees North there were no anomalies near LaNina's Territory. Refraction single station forecasting does not cover the entire Globe, but continuous world wide mixing of air is what causes varying refraction effects in the first place. So far this winter differential refraction readings are way up there, very comparable to the hottest year in NH history, 2007. There is heat above which will eventually merge with the rising spring temperatures from below. This not over the ground heat is as strong as 2007, implying a return to +1 C surface anomalies within 2 months. NH has already reached a +.57 C almost doubled from January's +0.31 C.
Extraordinary persistence of the cold temperature North Pole since last March 07 has its roots in clear air over Ellesmere North Baffin Islands area, which largely contributed to the great ice melt of 2007 summer. Clear conditions continued through fall/winter 07 with new Polar ice recovering quickly, giving frequent bouts of cold air usually migrating Southwest then to the deep mid-west. But there is a pattern recently detected, of which the total heat of atmosphere transect was found largely unchanged, despite cooler surface temperatures. 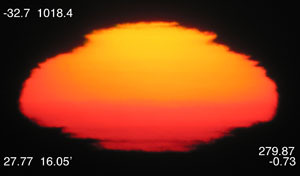 Experimental EROAM results, a form of optical density weighted temperature while using the sun as fixed sphere, shows Feb 2007 and 2008 very nearly identical, despite significant cooler average surface temperature in February 2008, EROAM for 07 and 08 at 239 Kelvin. This is also confirmed by more traditional ways of measuring DWT's, again showing very little difference between February 07 and 2008. Yet the surface was cooler in 08 by about 5 degrees C. Pressure usually plays a role as well, average pressure was nearly equal, leaving one possible explanation, it was warmer aloft, for large parts this was measured, again using traditional means, the average temperature difference between surface with respect to altitude maximas was +12 C, the greatest such difference since 2005. This is the reason why sun disk measurements do not reflect cooler surface, sun observations where 50% more numerous in Feb 08 compared to 07, again suggesting clear air as key in all major effects so far. Not really favoring one major climate system over another is a good thing. One becomes myopic, tends to blame everything on one single feature, yet weather is a combination of many gears which causes your day . Its obvious, most of the Northern Hemisphere (NH) is awash with warmer weather, this said there was a cold zone, eerily mimicking the last standing ice of September 2007, which was almost always present. It is fair to say, most of the NH was warmer around an area symbiotically supporting multi-year polar ocean ice. Immediate ramifications are obvious, North of the Archipelago area spawns cold air regional domes, especially during winter...It is the place where cold air thrives, at least for now. Dynamic wise, a High pressure naturally exists there, automatically often shored by Cyclones next to it. In the not so distant past, an anticyclone persisted North of Alaska rather often. This High influenced weather to all adjoining areas, but also enhanced the Arctic Ocean Gyre current and mixed the ice a lot more it seemed. Now I see a shift, of sorts where the persistent anticyclone has moved East, especially during winter, affecting the weather you know everywhere, perhaps a little more in North America. At first I thought that NASA GISS was in error, then NOAA confirmed January 2008 as a very cold month, and so ends since about 1996 a Northern Hemisphere monthly anomaly trend of strong warming.... Or is it? Recent sun disk observations does not agree, they fit between 2002-2007 observations, all of which had warmer air than 1996, which was a LaNina year preceding the massive ELNino of 1998. During the long night, there were a few clues about something different in the stratosphere, extremely strong winds of +200 knots were observed for a significant time period. This is similar to 1997, just like generally cold surface air probably peaking early, is there a massive ElNino coming? Despite these facts, I am not an ENSO causes everything proponent, like most who think it controls the worlds weather, ENSO is rather part of many other factors (Gulf stream for one) which combine and give your local weather. The other easily forgotten event is the thin ice in the Arctic ocean, which effectively split Siberian and Alaskan Air from merging. Causing highly localized High pressure systems, remarkably stable, to linger in the various regions where it got colder. But these Highs didn't exist without some significant Lows around them. Its the stability which was the main factor in this cooling, giving that the dynamics are remarkably predictable, what steadiness giveth will be what it will giveth some more, which is strong Highs with strong Lows under a higher sun will result in the exact opposite temperature wise. There is no reason to believe that January 08 anomaly will repeat itself for very long. Sun surprise. What's the score? Sun disk maximas after 24 observations between -1 & +2 degrees. Who would have known how strong refraction or the lack thereof would have enormous potential in temperature projections on a Global scale. Back in 2000 when EH2r was being devised, there was a feeling that I was heading in the great unknown. Undiscovered and raw, totally new observations were so numerous that it was impossible to settle on one refraction aspect or another. It was like going back to a University with images equations everywhere but no professors, I saw unbelievable sightings, as incomprehensible as beautiful. Luckily the Internet allowed me to go to some serious virtual classrooms, at least pointing the way towards better understanding what was then unexplainable. But those sightings became at times repeatable, yet the best instruments and measurements in the world, did not repeat the same way. There was an undercurrent of madness, why I saw had meaning beyond all known quantifications. Then it struck me, just as it struck Akhenaten, 3300 years ago, the sun image itself is divine, but in my case in a climatological sense. In 2003, out of a whim, just after a session at sky University, the idea of testing this divinity came about. But the real breakthrough came after keeping to basics, it seemed all too natural, it wasn't the sun, but the atmosphere which was playing with my eyes. Like the sun, the atmosphere is huge, especially when the sun nears the horizon, this is still a point of contention, soon to be, after all this time of research very much demystified. The understanding came then, sunset positions and vertical sun disk sizes, are a statement of physics from the atmosphere, just like an equation on paper describing nature, the sun disk is the equation result, a tangible number hardly needing translation. The atmosphere at the horizon being so large, is an opportunity if we can only measure its temperature as a whole, well the sun disk, is the temperature as a whole. From there it was thought that size matters, the thickness of air at the horizon sun is important, has inertia, or momentum. And so will vary with the temperature of the whole. From this point temperature projections were made, not for the region but for the whole Northern Hemisphere. And it worked! Extraordinary year just passed was dominated by the great melt of the Arctic sea ice, which took some heat out of some monthly anomalies, it seems almost from May till September. A year when the sun was at is lowest period of solar activity, even with an La-Nina at year end, despite all this, beating 2005 and especially 1998 the supreme El-Nino year by +0.15 degrees C. It looks more and more like there is a large body of heat in the Earth's atmosphere which maintains itself somewhere , while another smaller region has normal temperatures at the same time, this heat only escapes to space at a constant rate, if there is more moisture in the atmosphere, this rate will slow down, opening up the Arctic ocean will only add more moisture to the atmosphere, trapping more heat.